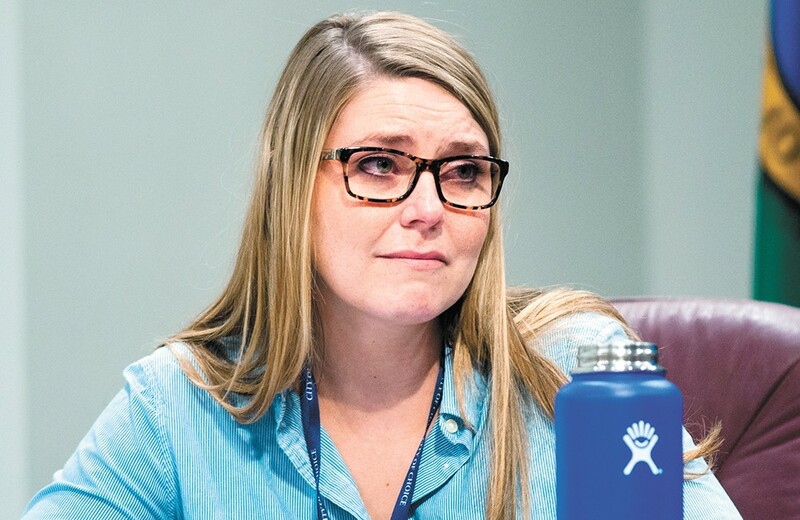 Councilwoman Kate Burke tears up at a recent council meeting where a citizen talked about the coming winter and the danger it posed to homeless people. As dozens of people file through security for their community court hearings at the downtown Spokane Public Library Monday morning, City Councilwoman Kate Burke approaches individuals, asking how the city could better help address homelessness. Many of the people here have been or are homeless. They're responding to low-level city citations for things like sitting or sleeping on public property. Armed with a clipboard and surveys, Burke wants to know which shelter options people want. Poster boards set up against one wall show some examples. Would it be good to have designated places for tent or car camping? How about more shelter beds or apartments? What about amenities? Should the city offer vending machines with things like tampons and toiletries? What about lockers and laundry access? The informal town hall of sorts comes only a week after House of Charity reduced its hours and the number of beds it provides in what had been the city's 24/7 shelter open to all single adults, regardless of sobriety. Burke's goal is to collect information from people who might be impacted by those changes, as well as the many others who don't want to stay in shelters, and push the city to rapidly address their concerns. "They're excited we're here to hear from them," Burke says, "because many of them feel like they're not being asked what they need and want when higher-ups make these decisions." Some tell Burke they don't have reliable access to cell phones or places to charge them, and they need more public restrooms. Others say they don't want more shelter beds or apartments, but options for single-space occupancy, Burke says, like sheds or huts. While nearly everyone agreed that things needed to change at the downtown shelter, which in recent months had been serving upwards of 300 people, Burke is mad things were changed before an interim solution was found for the 100 or more people who will no longer have a place to sleep. "Let's follow through on a commitment we made to the end of 2018," Burke says over coffee one morning just before the shelter reduction. "Yes, we know it's not working, but keep it going while we find another solution." Instead, the city plans to find a place for a second shelter with a similar open-doors policy, but that likely won't happen before July 2019, when the city starts its new 5-year service funding model. In the meantime, with council approval, the city will request proposals for warming shelters and other shelter space this week, but it's not clear yet how much funding will be set aside for those services, or what that will look like, says Kelly Keenan, director of the city's Community, Housing and Human Services Department. "We don't intend to put a specific dollar amount in this yet because we know we may get several types of sheltering solutions that people propose," Keenan says. "Once we receive responses ... staff will summarize that and we'll work with both the City Council and the administration to look at what the best path forward is going to be." But while staff at the city and Catholic Charities agree the Sept. 1 reduction at House of Charity was best for health and safety, Burke says the city can and should do more. "If 100 houses burnt down on the South Hill, we wouldn't be like, 'Well, they'll be fine until next spring, we'll provide a place for them to stay warm,'" Burke says. "We'd say, 'We gotta get our act together and house these people and get them shelter.' But because they're already homeless and likely don't have a job, we don't care about them. These are human lives that are gonna be lost." All month, Burke is taking that fiery passion into town hall meetings with people experiencing homelessness and those who work with them. At the library on Monday, Cate Patton arrives with her service dog Alphie, a German shepherd mix, to tell Burke the city needs to do more and ask how the amenity vending machines might be managed. "I think the city as a whole needs more places that are open and accepting," Patton says before meeting Burke. "Places in the idea that WorkSource is, helping people to get training and skills." Patton was homeless a decade ago in Florida when her addiction to opiates took control of her life. She says job training and a clean, supportive environment at the Salvation Army there helped her get back on her feet. She now carries the overdose-reversing drug Narcan with her everywhere, as she knows too well how large the opioid crisis has gotten. Just a few blocks from Burke's meeting, Jason Liberg and Jeremy Ransford sit in one of the alcoves on the Monroe Street Bridge, next to a rolled up sleeping mat, a box of bread and their other few belongings. The two men have been homeless off and on for the last few years and take care of each other. Liberg lost both his feet after stepping in a snowbank and they stayed cold and wet. But even after leaving the hospital in a wheelchair, he chose to stay outside. "I felt safer sleeping under the railroad than at House of Charity," he says. Now, Liberg walks with two prosthetics, and he and Ransford pretty much keep to themselves. They say they don't like talking to other homeless people, and they always clean up their trash. This is their city, and they try to respect it, they say. Ransford says changes made in the last few years, including passage of the city's sit-lie ordinance and installation of things like spikes or bars where people might otherwise rest, have successfully scattered people further from downtown. He's not sure if that's a good thing. "They push us from downtown, with the services, back into the neighborhoods where people live. Some people live their whole lives never having to see the riff-raff," Ransford says. "Whoever is pushing the homeless around, it's making everybody uneasy." While Ransford says he's been an addict most of his life, Liberg says he didn't become addicted to drugs until a spiral of bad events hit in 2015, including losing his longtime job, going through a breakup, having multiple friends and family die and losing his house to foreclosure. Both men say they are HIV-positive after sharing needles. Because of their health, they're hopeful they'll be able to get into housing before the cold weather hits. "If 100 houses burnt down on the South Hill, we wouldn't be like, 'Well, they'll be fine until next spring, we'll provide a place for them to stay warm. 'We'd say, 'We gotta get our act together and house these people and get them shelter.'" Meanwhile, they'll continue sleeping outside. While they've both been hit with citations for doing just that, they understand the need for some rules. But some things could change, Ransford says, including not making the cops be the bad guys having to enforce sitting or sleeping rules. "I can understand why you don't want people sleeping on the sidewalks or panhandling," Liberg says. "But there has to be some middle ground." Burke says she understands that not everyone likes the atmosphere at shelters, and some have been victimized there, so she hopes to help the city come up with different types of solutions. "Shelters aren't for everyone, just like apartments aren't for everyone," she says. Still, like Burke, not everyone was pleased with the fact that the city didn't start working on an interim shelter solution as soon as it became clear in June that House of Charity would need to reduce its numbers. During the Aug. 27 council meeting, Councilman Breean Beggs said he'd thought a plan was going to be in place by the time changes were made. "I was disappointed and frustrated when I recently learned that we didn't really have that plan ready to go, and that the House of Charity was going to be capacity reduced by 50 percent this weekend and we don't really have a solution for that," Beggs said. "Just this morning I walked outside, and I noticed it was raining and I again was thinking, 'What are people going to do?'" In addition to the request for proposals for warming shelters and nightly shelter space, the city has other things in the works, says Keenan, who oversees the main city department that works on homeless issues. "We know there are faith-based organizations and other groups that want to help provide some of these sheltering options," Keenan says. "We're looking at ways we can streamline that process and bring these groups in." The city also recently doubled the number of professional outreach workers it supports to go out and connect people with housing services. Additionally, Keenan says, the city is providing more money for a program that helps people get signed up for Social Security benefits in an expedited queue. Service providers are also working with the city and county to update the way that people are evaluated when they're brought into the service system. "That's a pretty critical step right now because that's about improving access to all of our system," Keenan says. "It's evaluating what's working and what's not working and what do we need to do to change that." By early 2019, Spokane also plans to roll out an enhanced rental relocation program, to provide assistance to people who might otherwise become homeless after being priced out of their rentals. With $300,000 set aside for that program, the city will rely on a community workgroup to help set parameters for how those funds would best be used, Keenan says. "It's necessary for us to think of ways to help people avoid entering the homeless system if there's any way we can," he says. In coming weeks, more changes will come before the council if Burke has anything to say about it. The councilwoman has already asked for help drafting plans for city-approved staffed campsites, and she may ask the council to consider repealing the sit-lie prohibition and camping rules. She's also considering how to offer lockers, laundry and shower services and looking at the potential for a pilot program that could provide water/sewer hookups for RVs to ensure people are living in sanitary situations. While she understands frustrations from the community about issues associated with homelessness, she also hopes to remind people that a large portion of her district is only one paycheck or accident away from losing their housing. The original print version of this article was headlined "Sleepless in Spokane"